Solved: Google calendars talking to Tempo Timesheet? Google calendars talking to Tempo Timesheet? Is there a way to connect google calendars with tempo tiimesheet in such a way that when an user accepts a certain meeting in google calendars it appears in his/her tempo timesheet? this is not supported in the current version of Tempo, but you can create a feature request in our Tempo timesheets project (https://tempoplugin.jira.com/browse/TT) and it will be evaluated by Tempo management. Little disappointed with lack of this essential feature for planning. Maybe I am wrong but isn't this connection with real life calendars supposed to be essential for planning ? I am forced to use this and I fell pain that I had to do this in two separate places. Go to Apps in the Tempo sidebar, click Install for the Google Calendar, choose the google email account you wish to connect to and then navigate to My Work to view the suggested plans. I created a chrome extension that does something like this (link below). It adds a Google Calendar button to your Tempo Timesheet page - clicking it will open a window where you can select which meetings you'd like to log work to. Try it out and let me know what you think. I tried you extension but I'm having problems login in. Do you have any faq/doc to explain how it works? It seems to be very interesting, but doesn't work. The same problem : I can't login in. Is there a fixed version? I updated the readme on the GitHub Repo with some screenshots as a little "how-to" – if you need more info, let me know. I hope this helps - feel free to reach out if any issues persist. Hey @Nadia Rabe - see if the above helps you as well. Your extension is amazing. Thank you! 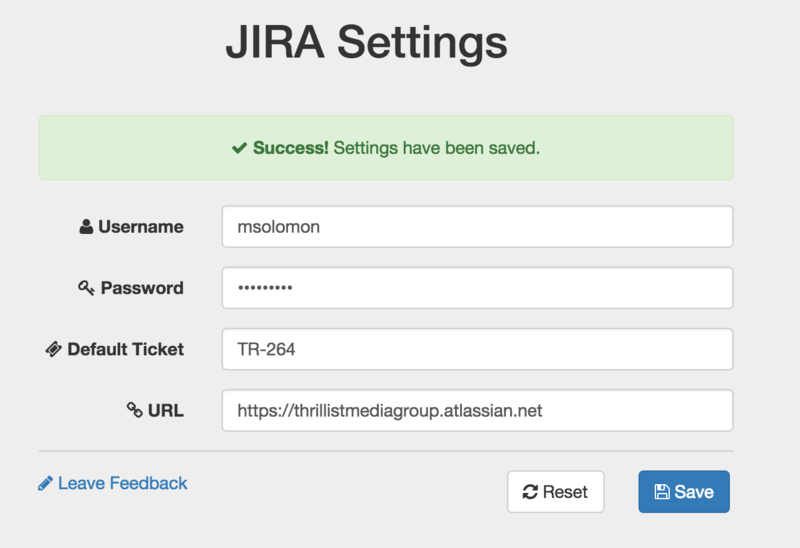 One thing, I noticed that calendar invites with JIRA tickets in the titles don't trump the default ticket. Is there a particular syntax the calendar invite needs for the ticket to copy? @Erin Forman (couldn't find you in the user mentions) I just tried to recreate that issue but was unable to looks like it's working for me? I am able to recreate your issue and I see the bug. I'll make sure to patch this in an update but for now, as a workaround, if you put anything in the description of the meeting the extension will work for you. Mike Solomon Thank you! The work around works. Sorry to reply you late. Thank you much because it works pretty well now. I just needed to change some url parameters inside code. This extension is exactly what I was looking for. 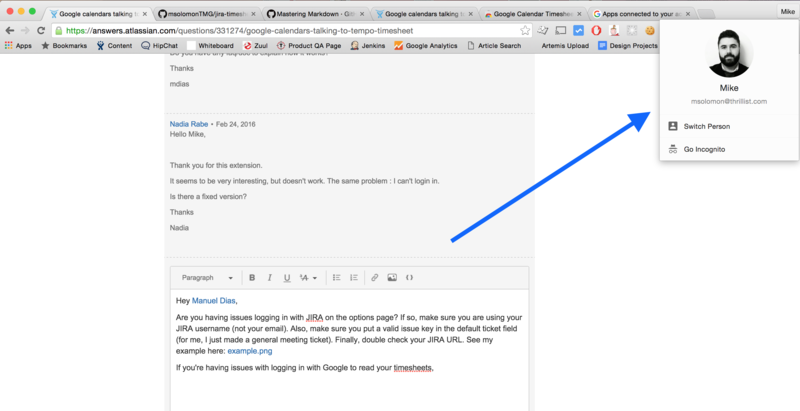 It saves my JIRA settings successfully, but when i search for google calendar events, it just says "Heads up! No meetings found for that date range." I can't figure out why it doesn't see my events, any suggestions? I love this add-on. It made my life easy. Now that tempo timesheets are updated I don't think this add-on works. R.I.P Google Calendar Timesheets. Thanks a ton, We will miss you. I can wait to see the developer make a new release that is compatible with new Tempo Timesheets. We're looking for the same thing. Has this been developed as of today? Same here, we would also really like / need this feature. Is there any news? Also looking for this feature, as well as getting a feed from tempo schedule to google calendar. Any idea if and when will this be available for the server version?